Officials are scurrying to mount a defense against a highly destructive coral disease sighted a week ago in St. Thomas waters. Members of the Virgin Islands Coral Reef Advisory Group met Thursday to hear firsthand from scientists who have been battling the disease in Florida and to discuss options for mitigating its impact locally. Leslie Henderson, the coral reef initiative coordinator for the Coastal Zone Management division of the V.I. Department of Planning and Natural Resources, said after the meeting that it was primarily an information exchange and general discussion. 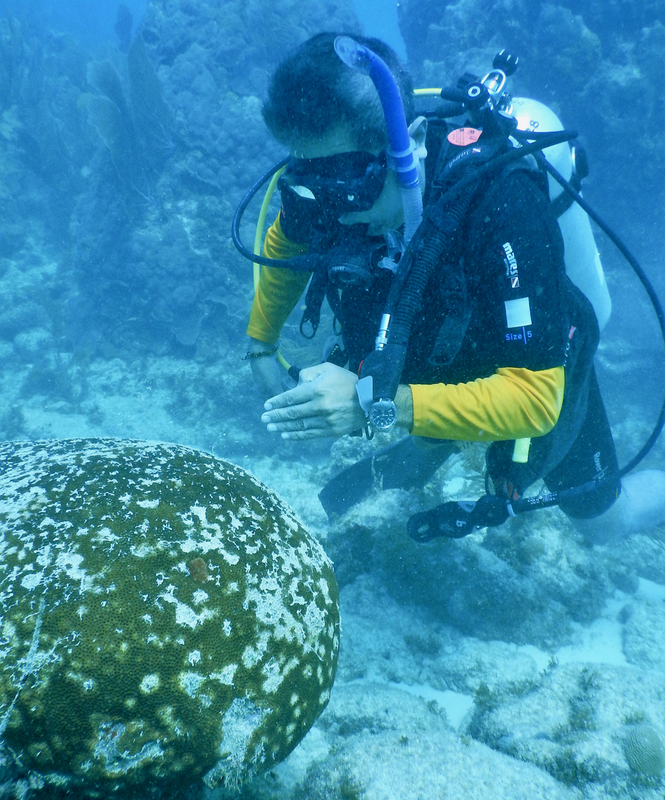 Known as Stony Coral Tissue Loss Disease, the mysterious pathogen has destroyed massive parts of the Florida Reef Track since it was first discovered in September 2014. It is an unusually aggressive disease, effecting hundreds of different species and spreading quickly. Its progress has been watched with trepidation not only by environmentalists but by tourism officials and fishing and marine interests. Marilyn Brandt, a coral researcher and professor at the University of the Virgin Islands, discovered diseased and newly dead coral at Flat Cay off the west end of St. Thomas last week. There is no laboratory test to confirm SCTLD, but Brant and other marine scientists determined its presence based on its characteristic symptoms. Since that discovery, Henderson said Brandt has looked for signs of the disease in nearby areas. So far, she has found it also in Perseverance Bay and Brewer’s Bay, on St. Thomas’ West End. DPNR has alerted dive shop operators who regularly conduct snorkel or SCUBA tours in those areas and is asking them to avoid those spots, Henderson said. It is suspected that the disease can contaminate equipment and thus be spread from one site to another. Several websites recommend avoiding effected areas and/or disinfecting dive equipment with bleach. Efforts to combat SCTLD in Florida have included applying antibiotics in a paste to effected coral and cutting tissue near diseased areas in an effort to deprive the pathogen of fuel to continue in a path through coral beds. Response teams in Florida have also been removing healthy coral to safe spaces, hoping to protect them until the disease dies out naturally or is brought under control and then to restore the corals to the reef track. According to the National Oceanic and Atmospheric Administration website, this program was stepped up early this year. Henderson was reluctant to discuss specifics of the Virgin Islands approach to SCTLD, saying the government doesn’t want to release information in “bits and pieces” and promising DPNR will issue a comprehensive statement in a few days. She said the Coral Reef Advisory Group – comprised of representatives from UVI, the National Park, the Nature Conservancy, DPNR and NOAA – has created a Disease Advisory Committee that will meet weekly.